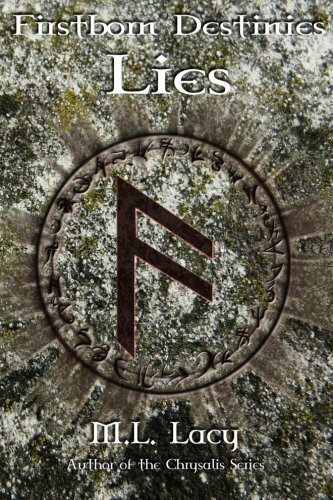 Article first published as Book Review: ‘Firstborn Destinies: Lies’ by M.L. Lacy on Blogcritics. “Firstborn Destinies: Lies” is the first book in the new series by M.L. Lacy. The story takes the reader on a paranormal journey towards fate, connecting all the dots that are every moment of our lives. Moments predestined, and not to be interfered with or questioned by mere mortals. Kelsey has always believed her parents died in a fire when she was three years old. A deathbed confession from her grandmother reveals that her parents actually moved away and left her in the care of her grandparents. As her entire world turns upside down, Kelsey tries to piece together bits of the past from a box of old letters and cards. One of the mysteries is regarding a pendant she has worn since birth, a pendant supposedly keeping her safe from unknown evil and danger. Kelsey suddenly finds herself on a quest to find out why her parents left her, and why anyone would want to cause her harm. Justin is a Magickal, and the firstborn Prince of his royal house. According to Justin’s star writing, his destiny is that he will wed the firstborn of another royal house, Princess Hannah. Justin refuses to believe Hannah is his soul mate and is reluctant to accept the foretelling of his fate. His feelings are confirmed when he meets Kelsey, who just arrived in town, and is looking for answers of a curious nature. As Kelsey’s learns her identity, the couple faces great danger in a race against time. The story is well written and captivating, and I thoroughly enjoyed the adventure. The author does a great job building an enchanting, magickal world that exists separately, though parallel to the human world, interweaving delightful nuances essential to the magnetic world of fantasy and magic. The characters have great depth allowing the reader to easily connect and relate, especially the protagonists, Justin and Kelsey. I must note however, that although the characters are older, (Justin in his 40s and Kelsey in her 30s,) I had a hard time reconciling that issue, as I interpreted their personalities to be a bit younger. Kelsey grows and matures as she deals with the lies she has believed since childhood, and a wiser, more confident Kelsey emerges by the end of the story. Her interactions with her parents are genuinely heartbreaking, and the way they continue to treat Kelsey is maddening. I highly recommend “Firstborn Destinies: Lies.” It is a dramatic, action-packed adventure that will appeal to fantasy lovers of all ages. A neatly crafted cliffhanger at the end of the story is enticing and leaves the reader wanting more of what promises to be another great series by M.L. Lacy.